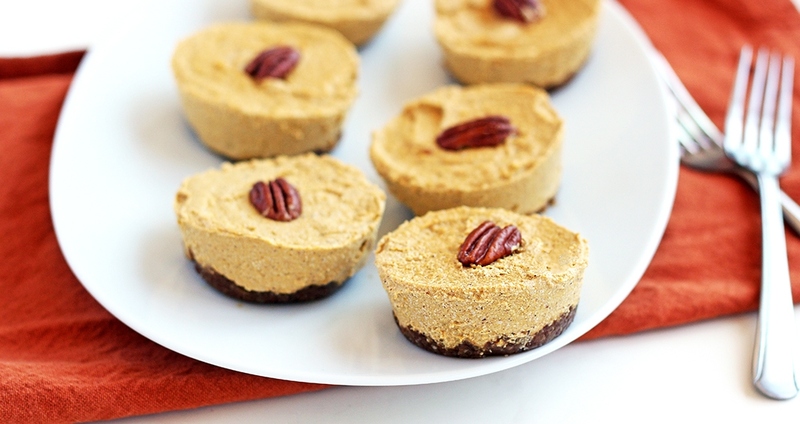 Who doesn’t love pumpkin cheesecake! This delicious version is quite healthy because it’s entirely vegan, gluten-free, and sweetened naturally with dates and pure maple syrup. It’s easy to make inside a muffin tin, but there’s no baking required! Enjoy with a cup of your favorite tea. Add the cashews to a medium bowl and cover with water. Set aside and allow to soak for 30 minutes. Reserve 6 pecans for garnish and set aside. Add the remaining pecans and dates to a food processor and pulse until well incorporated and a paste has formed. Melt the coconut oil and use to grease the inside of 6 molds in a muffin tin. Press the pecan mixture into the molds to create a crust/bottom layer.Drain the water from the cashews and add them to a food processor, along with the vanilla extract, pumpkin pie spice, salt, pumpkin purée and maple syrup. Process until smooth, scraping down the sides as necessary. Transfer the mixture into the muffin tins and smooth the top with a spoon. Garnish each center with a pecan. Place in the freezer to firm up for 10 minutes. Remove the cheesecakes from their molds, using a knife to scrape around the edges. Serve immediately or chill in the refrigerator until serving.